The first night of the 2012 Triangle Tournament opened with a great basketball game. For the second year in a row Souderton lost to Central Dauphin in a real close contest. This year Central Dauphin prevailed 61-60. Both teams played very good fundamental basketball. Souderton led 24-22 at the half. A high scoring 3rd period for both teams had Souderton hanging onto a slim 45-44 lead. Ryan Beaver (6’2″ senior) is Central Dauphin’s Mr. Do-it-all. Ryan tossed in 6 three pointers on his way to a tournament best 28 points. Team mate Brian Laird added 3 from beyond the arc and ended up with 15 points. Souderton had it’s triangle offense going with three players scoring in double figures. Big 6’8″ Brendan Wagner led the way with 18 points. John Kanas notched 17 and Austin Murphy (5’11″ senior) scored 12 including 3 treys. The 2012 Tournament gets underway. 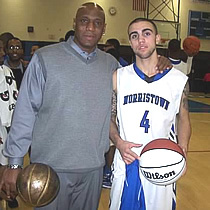 Thursday’s night cap had the Norristown gym filled with the tournaments largest crowd in the past five years. The place was rocking with students from both John Paul II and Norristown cheering on their teams. In the end Norristown escaped with a sloppy 34-31 victory. The games tempo was established early by coach Jack Flanagan’s Golden Panthers. Both teams had difficulty putting the ball in the basket. At the end of the first period Norristown led 2-0. Yes, that is correct, two to zero. Scoring picked up a bit, but there were more turnovers and missed foul shots than field goals. Norristown led at the half 16-12 but the John Paul crowd was loving it. They sensed an upset in the making. The upset did not happen, but John Paul gave the Eagles quite a scare. John Paul’s (6’4″ senior) Jamel Stinson turned in an awesome effort with 17 points and 12 rebounds. The long arm of Norristown’s defense (6’6″) Josh Johnson scored a team high 11 points along with 3 big blocked shots. Hustling guard Luke Kelley added 8 points. The big question was would Norristown be ready to face Central Dauphin on Friday night in a rematch of last years championship game? Not until coach Mike Evans would make his Eagles practice foul shots after the game as fans filed out of the gym. The Golden Panthers discuss strategy. The Souderton Indian huddle up. Fridays preliminary game was also a close exciting contest as Pope John Paul II held on to beat Souderton 51-49. Mr. Inside Jamel Stinson and Mr. Outside Brent Mahoney each scored 19 points for John Paul. 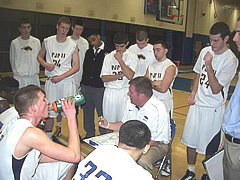 Both seniors stand about 6’4″ and have coach Jack Flanagan’s Golden Panthers off to a fine 6-3 record. Mahoney hit 3 shots from beyond the arc and Stinson grabbed 11 rebounds and shot a perfect 11-11 from the charity stripe. 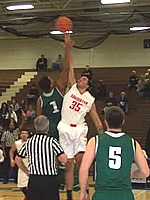 Souderton’s John Kanas tossed in game high 26 points and he had two day tournament total of 43 points. The 6’2″ Kanas left it all out on the floor for coach Pete Chimera’s Big Red Indians. Big 6’8″ center Brendan Wagner chipped in with 11 points. John Paul led 26-20 at the half. Souderton closed within 36-35 at the end of the third period. The game went right down to the wire until John Paul’s Stinson clinched it at the foul line. It took one year and one overtime for the Norristown Eagles to defeat the Central Dauphin Rams. In doing so, the Eagles regained the Triangle Club Holiday Tournament trophy. The final score was 74-64. What a game! What a comeback! The undersized Rams were playing smart basketball. Coach Jay Crosier had his team blocking the lanes on defense, boxing out, minimizing turnovers, working for good shots and hitting their three pointers. At the halftime buzzer little 5’8″ Austin Mertz hit a deep off-balance three pointer and was fouled in the process. He calmly sank the free throw. Central Dauphin went into the locker room with a 34-27 lead. The Rams outscored Norristown 15-9 in the 3rd period to build upon their lead 49-36. In the final frame, with just 2:30 left on the clock and Norristown facing a 16 point deficit, coach Mike Evans’ Eagles finally began playing like their hair was on fire. Behind the inspirational play of 6’0″ guard Luke Kelley with a couple of big steals and driving layups, the crowd sensed that this championship game was not over yet. Norristown finally utilized their height advantage, blocked shots, pressed and trapped Central Dauphin guards and dove on the floor for loose balls. With less than a minute on the clock tiny (5’9″) Curt Lever (17 points) hit a three pointer for Norristown to tie the game at 58. The crowd went crazy. Central Dauphin felt the game slipping away but could do nothing to stop it. Norristown was making their free throws (22-32 on the night) and Central Dauphin was running out of gas. Norristown saved their best for last and outscored Central Dauphin 16-6 in the four minute overtime and won going away 74-64. Central Dauphin made 8 three pointers to Norristown’s 4. Senior guard Brian Laird stands only 5’9″ but was the Rams floor general and canned 21 points. He had a great two day tournament. Manny Gonzalez and (6’4″) Zayd Issah (Penn State football bound) added 11 and 10 points, respectively. Coach Crosier has a well balanced 8 man rotation. Coach Mike Evans scratched his head and tried various player combinations before his Eagles responded. Nine players made the scoring column. Luke Kelley led the way with 20 to go with Curt Lever’s 17. Six feet five Forward Jahbri Hargrove scored 8 points and hit some key free throws during the Norristown comeback. Guard Bernie Gordon added 7 points and Danny Orr came off the bench and chipped in with 6. Current Temple star and two time Triangle MVP Khalif Wyatt (Norristown class of 2008) was leading the cheers in the stands for his alma mater. He helped present the 2012 MVP trophy to Luke Kelley. Luke Kelly, Tournament MVP with Khalif Wyatt. 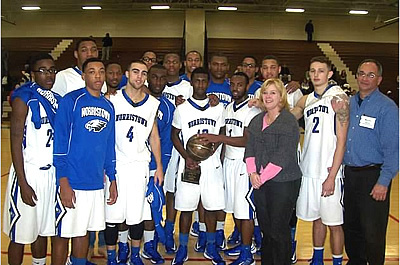 Tournament Champions – Norristown Eagles.